At AWS re:Invent 2018, the AWS Partner Network (APN) announced updates to the overall APN program. This includes updated APN Tier requirements and benefits for APN Partners. A complete list of changes is available for download from APN Partner Central. Here’s what you can do today to help your organization prepare for the upcoming compliance deadline. The Membership Renewal Date is the date on which your organization is evaluated, on an annual basis, for compliance at your current APN Tier level. This is also the date on which the annual APN Membership Fee is billed to your organization. APN Partners with a Membership Renewal Date between January 1, 2019 and July 31, 2019 will be given until Q4 to become compliant with newly-announced requirements at their current APN Tier. Specific compliance dates will be communicated soon. APN Partners with Membership Renewal Dates August 1 or later will be evaluated for compliance with tier requirements on their Membership Renewal Date. 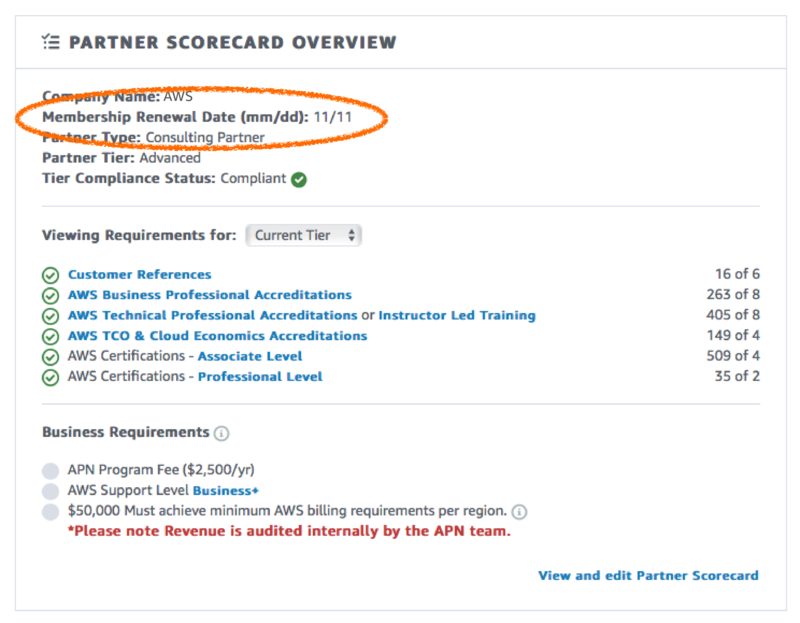 The Alliance Lead for your organization can find the Membership Renewal Date in the Partner Scorecard Overview when logged into APN Partner Central. In 2019, APN Consulting Partners will be measured on the number of Opportunities they launch within the 12 months preceding their Membership Renewal Date. APN Technology Partners have the option of meeting either a Launched Opportunity or Direct Revenue Requirement under the new Experience category of the APN Program changes. APN Partners can realize additional Opportunity-related benefits by applying to participate in the APN Customer Engagements (ACE) Program. The program also provides a series of best practices to help you make the most of the Opportunity submission process. UPDATE 2/26/19: Through March 31, 2019, APN Partners can leverage the AWS Revenues tool in APN Partner Central to report Opportunities that launched between August 1, 2018 and December 31, 2018, but were not submitted via the APN Customer Engagements (ACE) platform. APN Partners should take this time to input all previously launched opportunities in order to receive Launched Opportunity credit for 2019 prior to the March 31 deadline. Now is the time to make sure that all employees who support your AWS practice are registered for access to your APN Partner Central account. By entering their business email address (that uses the domain associate with your Partner Central account) each user will be automatically connected to your account. Your organization’s Alliance Lead can proactively invite new users to register from within APN Partner Central. By registering for access to APN Partner Central, users have access to free online and heavily discounted in-person training. In 2019, registering for access to your APN Partner Central account will be the primary means of connecting each user’s AWS training, AWS Accreditations, and AWS Certifications to your organization’s Partner Scorecard for the purpose of APN Tier eligibility and compliance. Many users originally registered for an AWS Certification exam using their personal email address. In an effort to streamline and improve the overall AWS Certification reporting process, all users now have access to an “AWS Training and Certification Email” field within their APN Partner Central User profile. Providing this information allows each individual’s training and certification data to be appropriately associated with the APN Partner for whom they work. This field allows users to provide us with the email address originally used to create their AWS Training and Certification account. The APN Partner Central user profile can be accessed by selecting “View My Profile” within APN Partner Central.